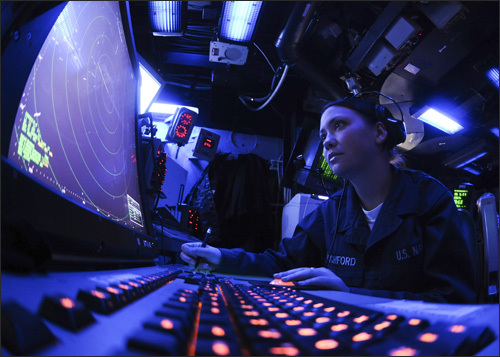 Submarines, Humvees, aircraft, ships, and even server rooms share a common theme: minimal space for personnel and equipment. And the computer workstations needed for the mission or task at hand are a vital component to achieving the day’s objectives. Not only must these systems and monitors be compact and easily accessed by highly active team members, but they also need to be ruggedized to withstand serious shock, vibration, and impacts, as well as meet MIL-STD-461 requirements for EMI. Now more than ever, streamlined and lightweight—but rugged—workstations are a necessity for military and industrial servers. 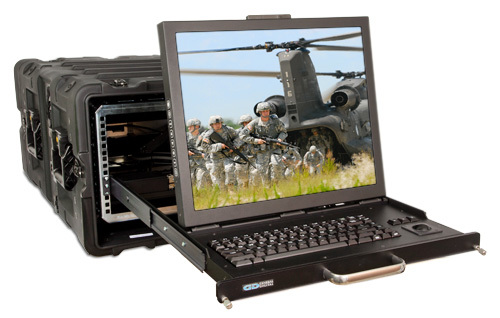 Whether you are running a small server in a mobile transit case or Pelican™ case, or a large server in a full-size stationary RETMA rack, we manufacture many types of fixed monitors and rack mount drawer-mounted flip-up monitor-keyboards. With display sizes from 6.5″ to 65″, at a variety of resolutions, we can accommodate nearly any requirement. We have exactly what the military needs for those crucial moments where dependability is of the utmost importance. If you can think of it, our engineers can make it a reality. If your specs call for a rack mount, panel mount or standalone monitor, have a look at our super rugged Saber Series, our waterproof sealed Barracuda Series or our large format Titan Series. They can easily be paired with one of the many advanced desktop and rack mount keyboards we offer. Or perhaps you need a flip-up display rack drawer with integral keyboard and trackball, which our 1U high SlimLine 1U Series and 2U high SlimLine Lite II Series will cover nicely. For more display real estate, you’ll appreciate our flip-up dual display-keyboard rack drawer, the TwoView. If you don’t need a keyboard, there’s the rugged single display SlimLine Micro Series and dual display TwoView Micro Series, both of which can be rack mounted, ceiling mounted, or even wall mounted. For space-saving, military-grade LCD monitors that will serve in your workstations well into the next decade (and probably beyond, if past experience tells us anything), you will be best served by a General Digital monitor. Contact a Sales Engineer today for a no-obligation consultation.